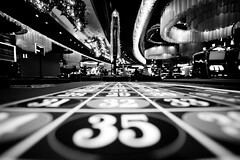 Blog » Betting Strategy » When is Gambling an Investment? Hi my name is Paul Bradbury a tennis tipster on BetAdvisor and this is the second in a series of articles I am writing for BetAdvisor on gambling and various concepts to help you become a better gambler. The last article I wrote was called The Law of Large Numbers and was written whilst I was still trialing on TipsterAcademy. I was originally going to call this article Investment vs Gambling, but upon reflection changed my mind as I believe all but guaranteed return investments are a form of gambling, and guaranteed returns are not as guaranteed as people like to believe. Basically every time you stake money on an outcome that is unknown and risk losing some or all of your stake money then you are gambling. When you buy a stock or share you are gambling. When you buy a unit bond you are gambling. As we all saw during the banking crisis even when you place money in a savings account you are gambling that the institution will remain solvent and honour its debt to you. Q. When does a Gamble become an investment? A. When the expected value of the return is positive in the long run. Simple when the reward for the event outweighs the risk involved. That does not mean I will make money on every investment, it means that if I made the same investment over and over again I would win in the long run. I would like (as I did in my last article) to turn to the casino to demonstrate this simple concept. Now when a punter comes in and plays roulette they are gambling they do not know the outcome of the nights events in advance, but what most people do not consider is the house is also gambling they also do not know the outcome, and they run a very solid chance of losing in the short run as they have a very small edge (2.7% see previous article). I dare any of you to disagree that the house is making an investment when they pay out, whilst as the punters are onto a losing deal, we all instinctively know the house always wins in the end as they have an edge. So from my previous example it becomes clear that to have an expected positive return in the long run we need to have an edge, in all the investments (gambles) we make. Another example of this would be the dragons den, I enjoy taking the time to sit and watch this and am amazed at the sums of money the dragons throw at ideas that to me seem way out there, however, behind the scenes due diligence is done and the risk vs reward is carefully calculated by the dragons so they know in the long run that they will be up on the sum of their investments (gambles). This is because they are experts in their fields and experts at spotting an investment with an edge. They have worked on these skills through trial and error and have lost (as well as won) a lot of money in the process. From this example I hope to get across to you that a good investor spreads his risk, he never stakes more than he should on a single unknown outcome, a dragon is only ever investing a small proportion of his child’s inheritance on each possible outcome. He is however like the casino taking as many spins as possible, looking for every likely investment that has more reward potential than risk involved. He is keeping his money working to make as many rewards as possible. He spends hours working out what is a good investment and running calculations on return vs investment (why do you think they are so interested in the numbers?). So now you understand that all investments are gambles but not all gambles are investments the last concept I need to get across is the importance of concentrating on decisions and ignoring short term results. This will be a theme through all my articles and is the most important concept a gambler needs to understand. Decisions are the only thing an investor controls, where to put his money, how much to risk etc etc. A casino does this by setting table limits a dragon does this by only offering a proportion of his money to each high risk investment. In the long run you can judge the decisions by their results but the long run is a long time, in the short run the only considerations a real investor should take are the following. What is the worst possible result of my decisions losing? Does the reward on offer outweigh the risk involved? If every time you make an investment decision you answer these questions then in the long run you will be a winning investor. The first decision is to do with bankroll management which I will cover in another article, the second is to do with positive expected outcome. So to become a winning gambler you can either become an expert at sport who can calculate the expected outcomes better than the bookmakers and control your bankroll, or you can follow a tipster who is already an expert at this and will calculate for you what to bet and when a line has a positive expected outcome. I do both, I follow some tipsters and I calculate the percentages at tennis. I like tipsters who work my money who place lots of bets and don’t just leave my money sitting doing nothing making the bookmakers interest, I look for tipsters who have a good long term record and not just a lucky streak. I like my tipsters to take risks with high rewards. A perfect example of this type of tipster is Aiden Monroe who if you look at his overall record will make you think twice about how short term thinking is not what investing is about. Anyway I would love to discuss any of the concepts in my articles or any of the tips I have made and the reasoning behind them with you and am available on twitter @PaulBradbury13. Happy investing.